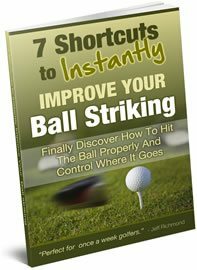 If you want to hit longer golf drives this weekend then read this article for simple golf tips to help you do it. The first thing you can do to hit longer golf drives this weekend is to do some active stretches before you tee off. It has been found that golfers who do this hit the first drive over 10 yards longer than golfers who do not warm up. You can do simple calisthenics for your warm up like star jumps, toe touches, body twists etc. So do active flexibility exercises for about 5 minutes before you tee off and you will hit longer drives. Second, one of the biggest aspects needed for longer drives is to hit the sweet spot on your driver consistently. If you miss the sweet spot by just half an inch it can cost you serious yards. To be more specific, according to Golf Digest, if you swing your driver at 100 mph and you hit it on the sweet spot your golf ball will travel 258 yards. A drive that misses the sweet spot by half an inch will go 243 yards. A drive hit 1 inch off the sweet spot will go 227 yards. So if you miss the sweet spot by 1 inch you will lose 31 yards! The point I’m making here is that if you want to hit longer drives this weekend then you need to focus on hitting more solid shots out of the sweet spot. Another important aspect you must be aware of in order to hit longer golf drives this weekend is how you tee up the golf ball. If you suffer from a slice problem then you need to know that by teeing the ball up higher than normal it will help you to fix this dreaded swing flaw. Equally if you have a hooking problem you can simply tee the ball lower to help rectify this problem. Ok, let’s sum up what you need to do so you hit longer golf drives this weekend. First, you need to warm up for at least 5 minutes before you tee off. When you do hit your drives you need to focus on hitting the ball out of the center of the clubface. 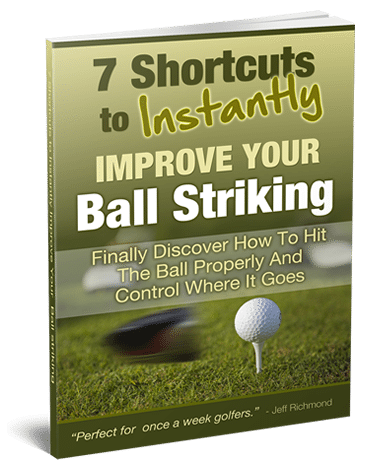 Finally, if you suffer from a slice or a hook problem then when you’re teeing up your golf ball do so either higher or lower than you normally would, according to which swing flaw you have, to help you hit straighter, longer drives. If you do these simple things you are bound to hit longer drives this weekend and consequently have more fun playing golf.